Use of the word "palace" in different languages is differing. In English this term designates an impressive and/or ornate residence of very influential person - for example - king, duke, archbishop. In different countries usage of this and related terms is different - according to the history of respective country. In Latvia there are many "palaces" which are far from being magnificent residences of royal persons. If we use the term "palace" in its strict meaning Latvia would have the following palaces - Rundale, Jelgava, Bauska ducal palaces. Use of this term to refer to other buildings becomes somewhat questionable. In order to decrease uncertainties this category includes one more term - "manor house". Manor house served as the administrative centre of manor and as a residence of country nobleman. Sometimes such manor house in Latvia may look like real royal residence - such exquisite buildings in Latvia are, f.e. Cesvaine palace, Stameriena palace and smaller but majestic Birini palace. Author in this Website uses the term "palace" often - this is shorter and often these buildings really are ornate and majestic. Category includes medieval castles as well - these landmarks form also their own - special category. Traditionally palaces and castles in Latvia are located in rural setting - this differs Latvia from such places as Venice or Paris with numerous innercity palaces. But there are certain exceptions. Often a town has formed around the medieval castle after it was built - in a such way there appeared numerous present-day towns of Latvia. In later times around the old rural country estates formed contemporary villages. Interesting monuments are also the manor houses of small suburban manors - such buildings were abundant in Riga (see Manors and castles of Riga). City increased and these manor houses became a part of urban environment. Often influential families built opulent residences in downtown as well. Such building, f.e. is House of Benjamins in Riga. But here in Latvia such buildings are not considered to be palaces. Contrary to the situation in most countries in Latvia it is comparatively simple to identify a moment when there started construction of castles and palaces, and when - ended. Castles here were built well before Western European conquerors (12th century) - but these woden castles have not been preserved and together with their surrounding settlements are included in category "Ancient settlements". The oldest stone castle in Latvia - Ikskile bishop's castle - has been built in 1185. Age of medieval castles ended when the newly built palaces were not fortified anymore - in Latvia this time came with the 17th century. Construction of castles here ended with the start of First World War - Latvia gained independence after this war and then nationalisation of land took place and nobility lost its influence. 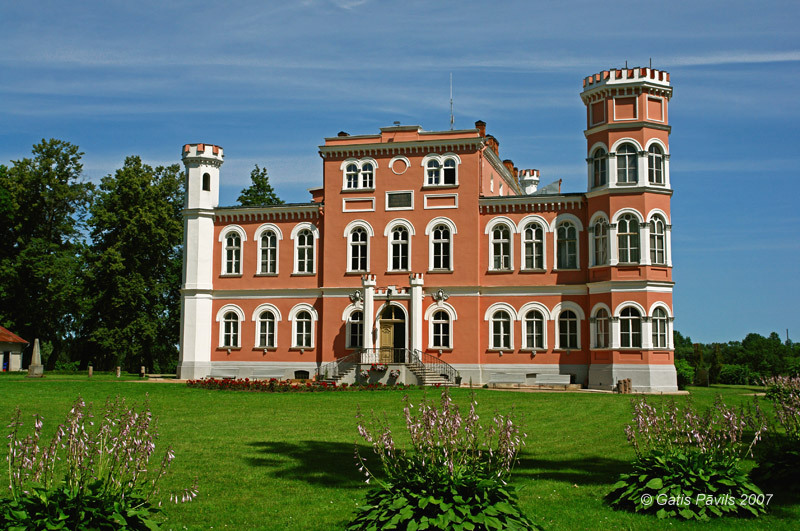 Thus it is possible that the last palace in Latvia was Veckarki palace which was built in 1913. Unfortunately soon after its construction it was heavily damaged in war and today only ruins remain. The oldest known royal residences are located in Egypt, Thebes, exceptional palaces have been built also by other ancient cultures - but for most part these buildings were destroyed in later times. Incomparably larger amount - tens of thousands of palaces and manor houses have been preserved from younger times. Such palaces could be found almost in every land. Only Antarctica does not have them for sure. After the long age of fortified medieval castles the palaces of new times were first built in Italian towns at the end of 14th century. In 16th century in Italy there were built villas - intricate and magnificent rural residences with refined landscape around them. Thus the oldest non-fortified palaces in Europe belong to Rennaisance style. Outstanding examples of such villas have been designed by architect Andrea Pallado for the rich Venetian nobleman, f.e. "La Rotonda" in Vicenca. Over the time there changed style of palaces - in 17th century Rennaisance was replaced by Baroque which also started in Italy. During the Baroque age many royal and noble families in Europe got especially strong influence and as a result there were built enormous palaces. This includes the most popular one - Château de Versailles near Paris. Palaces of Baroque age belong to the most ornate buildings in world. 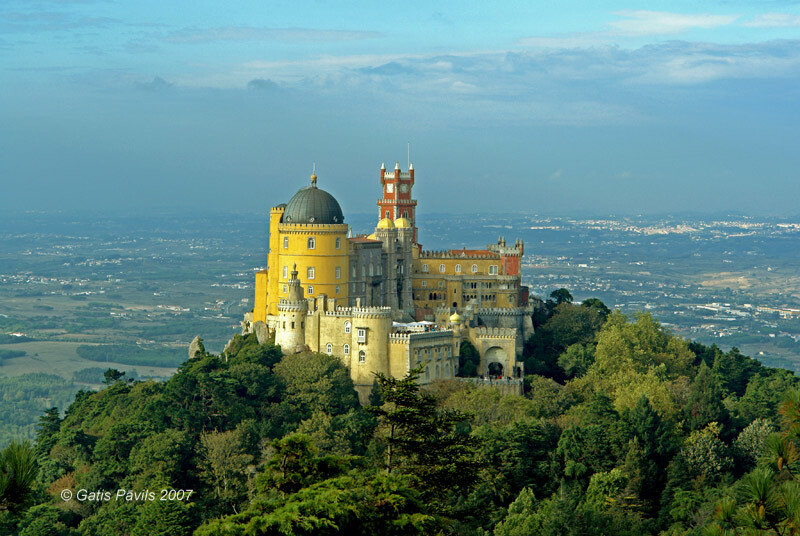 Pena National Palace in Portugal - example of early Historicism. At the end of 18th century after Baroque and its variety - Rococo there followed Neo-Classicism (often called simply - Classicism) - this style started in several Western European countries. Origins of this style come from the obsession with the culture of Ancient Greece and Rome. After the exorbitance of Baroque Neo-Classicism is characterised with reserved elegance. In this time there have been built numerous palaces, but it seems that none of them has become a star of architectural heritage of world importance. Neo-Classicism was an early beginner of Historicism. In parallel with the interest in ancient Greek and Roman heritage there rised interest of artisans and architects in revival of other kinds of architectural styles. In 19th century there formed several kinds of Historicism including Neo-Gothic, Neo-Romanic, Neo-Rennaisance and others. These styles were much used in design of palaces and during the age of Historicism there have been constructed numerous interesting and ornate buildings with recognised architectural and touristic value. Tourists know well the Neuschwanstein Castle in the south of Bavaria (Germany). There have been built numerous luxuriant Historicism style palaces in Northern and Southern America, for example Chapultepec palace in Mexico. At the very end of 19th century there formed the next style - Jugendstil (Art Nouveau). Unfortunately this style left little influence on design of palaces - in this time influence of nobility decreased. Last palaces and manor houses in Europe were built at the first half of 20th century, for example - in the Eastern part of Germany - up to the Second World War. Elsewhere in the world, especially in Asia and Africa there still are constructed palaces - residences for local nobility and influential people. Thus for example in Brunei there has been constructed the world's largest residence belonging to a private person - Istana Nurul Iman palace. Influential and rich people in Europe and elsewhere are building enormous private residences ar well - sometimes larger and more ornate than most palaces. Such buildings in general are not considered to be palaces. 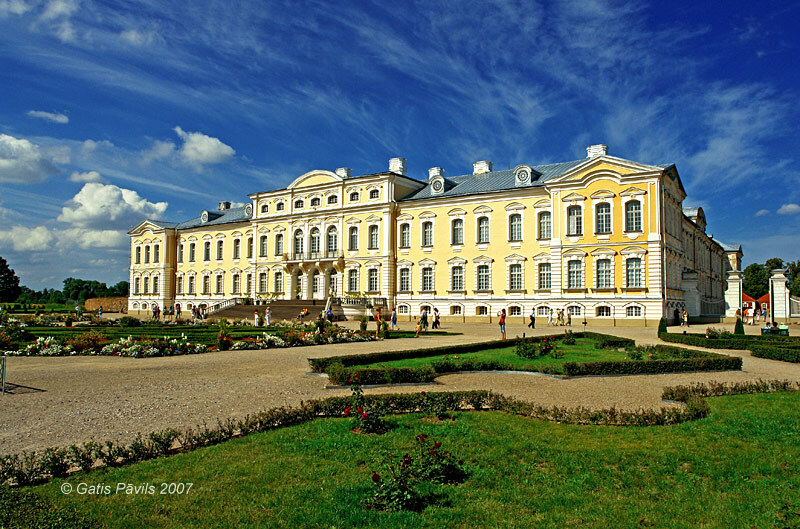 In total in the area of present-day Latvia there have been built several thousand palaces and manor houses. Today there exist more than 1000. Although majority of these buildings don't look like majestic fairytale castles - they are important monuments of local history. Due to this each such palace or manor house needs to be protected as monument of architecture and history. Numerous manor houses are located in the middle of village, with numerous architectonically interesting subsidiary buildings around. Such manor centres traditionally have larger or smaller parks and beautiful causeways leading to the palace. Jelgava Palace - Jelgava. Largest palace in Latvia, built in 1738.-1740. in Baroque style. Rundale Palace - Bauska district, Rundale municipality. Nowadays this is the most outstanding Latvian palace, built in 1736.-1768., Baroque and Rococo. One of most outstanding and most interesting landmarks in Latvia. Zalenieki Palace - Jelgava district, Zalenieki municipality. Baroque, 1768.-1775. Varaklani Palace - Madona district, Varaklani. Late Baroque - Neo-Classicism, 1783.-1789. Kazdanga Palace - Liepaja district, Kazdanga municipality. Neo-Classicism, 1800. Mezotne Palace - Bauska district, Mezotne municipality. Neo-Classicism, 1797.-1802. Jaungulbene Palace - Gulbene district, Jaungulbene municipality. Neo-Romanic, 1830ies. Vecauce Palace - Dobele district, Auce. Neogothics, 1839.-1843. Birini Palace - Limbazi district, Vidrizi municipality. Neogothics, 1857.-1860. Aluksne New Palace - Aluksne district, Aluksne. Neogothics, 1860.-1863. Preili Palace - Preili district, Preili. Neogothic, 1860.-1865., now in ruins. Stameriena Palace - Gulbene district, Stameriena municipality. Neo-Rennaisance, 19th century. Cesvaine Palace - Madona district, Cesvaine. Historicism, 1897. Jaunmokas Palace - Tukums district, Tume municipality. Historicism, built in 1901. Luznava Manor House - Rezekne district, Luznava municipality. Jugendstil, 1905.-1911. This choice is relative - other authors would include other palaces. F.e. enthusiasts of cultural heritage and architecture would include here Ungurmuiza palace, Kabile Palace. After the reconstruction everyone sees how wonderful are Malpils, Dikli, Igate, Rumene and many other palaces. Sometimes especially lovely is some unsighty manor house - author loves the remote Birzi manor house in Kuldiga district or the small wooden manor houses in Riga. 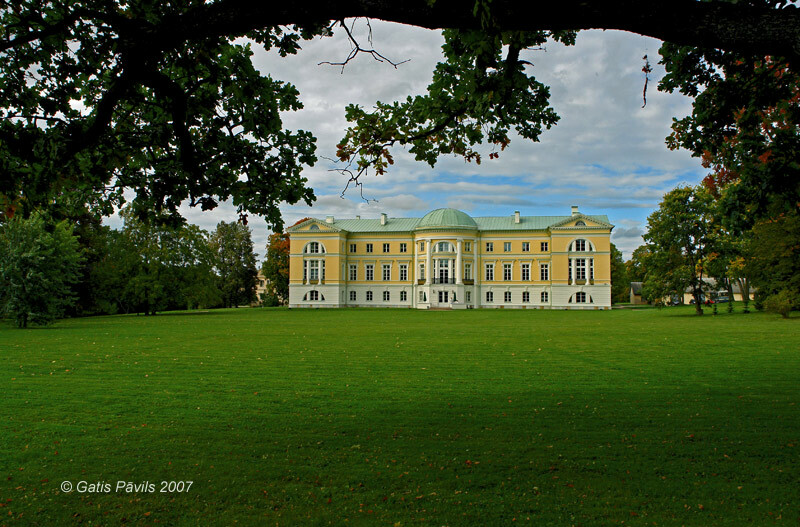 Below are listed all the palaces and manor houses of Latvia described in this website. Each column in this table is sortable by alphabet - just click on the header of the table. The first column - "No." - gives an order of appearance of the landmark in this website. Grey colored monuments have not been preserved up to this day.